This entry was posted in Safety gear & equipment on 2018/12/05 by Susan. The week’s theme focused on safety when working at the back of vehicles. 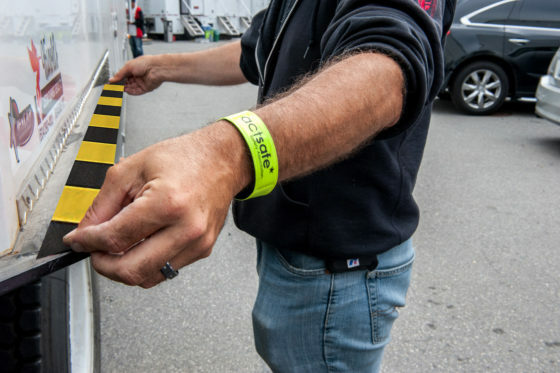 To reach out to workers, the Actsafe team visited film sets around B.C. Working at the back of vehicles is one of the most significant hazards for workers in the film industry. That’s why Actsafe (the health and safety association for B.C.’s entertainment industry) focused on this issue during their first-ever Actsafe Injury Prevention (AIP) Week, which ran from November 5 to 9, 2018. Actsafe reports that 58 percent of grips have experienced a work-related injury due to loading or unloading trucks. In case you didn’t know, grips are film crew workers who work on equipment that supports cameras and lighting. They use tripods, overhead tracks, dollies, and other equipment. The theme for this first AIP Week was “Back here, safety matters” — referring to being at the back of a vehicle. During the week, members of the Actsafe team visited 33 productions and dropped off welcome bags containing resources, tips, and specialty tape for truck tailgates. Don says he and his team at Actsafe are working on another new event that will launch in Spring 2019. I’ll have an update on that when I know more — in the meantime, thanks to Don for answering all my questions. Check out the Actsafe website for more information on AIP Week 2018.